Small autograph album, approximately 3-3/4" x 2-1/2", that includes 27 pages signed by relatives and friends of owner Katie Elizabeth Brainerd, or Katie Elsie Brainerd, of Boynton, Quebec, in the Eastern Townships, or Cantons-de-l'Est. I'm not sure Boynton still exists as a legal entity, but it's either a part of or in the area of Stanstead, near the Vermont border. The album was presented to Katie in 1883 by a Jennie, who was possibly Jennie Rose Brainerd, Katie's older sister. Another Jennie, Jennie Gregory, signed a page some years later in 1890, but the handwriting appears different from that on the presentation page. Katie Elizabeth Brainerd was born 9 May 1876 at Boynton, Quebec, the daughter of Israel Brown Brainerd and wife Naomi (Quimby) Brainerd, both natives of Stanstead, Quebec. Katie's paternal grandparents were Israel and Rosamond (Brown) Brainerd. Her maternal grandparents were John Moore Quimby and Naomi (Moulton) Quimby. Katie married Carlos Gordon Mosher, son of John and Mary Corilla (Mosher) Mosher. Katie and Carlos had at least four children. Katie died in 1960, and Carlos in 1963. 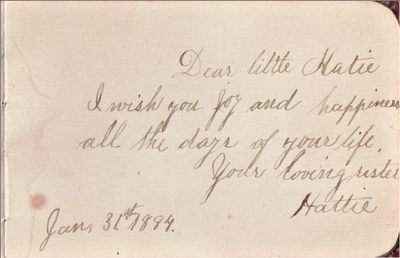 I believe the page below was signed by Carlos Gordon Mosher in 1889, long before he and Katie were married. And possibly this page as well. Katie's older sister Hattie Ethel Brainerd signed a page in her album in 1884. An Emma signed a page in 1888. Emma may have been Emma Naomi Brainerd, Katie's older sister. Two signers indicated that Katie was their cousin. Cousin Lizzie Brown signed a page. Katie's cousin Ward Leon Brainerd signed a page. He was born 3 February 1881 at Stanstead, Quebec, son of Timothy Erban Brainerd and Nellie Victoria (Ticehurst) Brainerd. He married Eva Laura Bridgette and had at least two children. Some other signers in the Katie's album were surnamed Ticehurst. Estella A. Ticehurst signed a page in 1886. 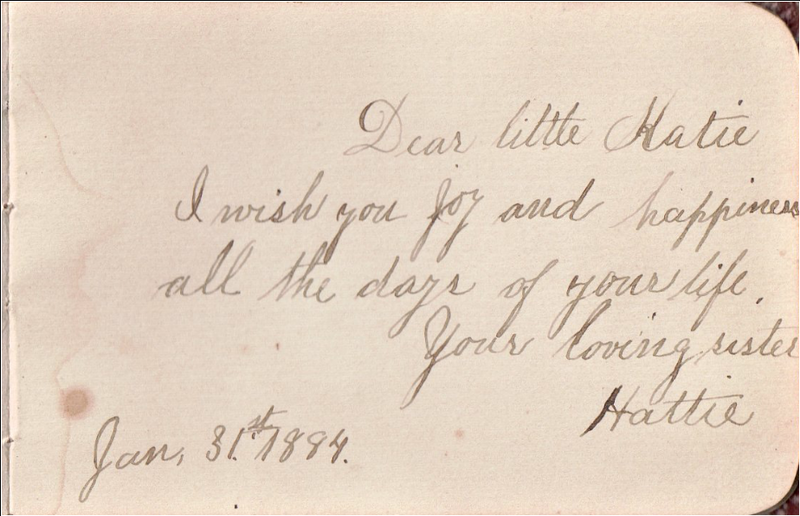 Mrs. E. A. Ticehurst signed a page in 1884. Luther Ticehurst signed a page in 1889. In addition to Lizzie Brown above, some other people surnamed Brown, the maiden name of Katie's paternal grandmother, signed pages in her album. Susie Brown of Boynton, Quebec, signed a page. Joe Brow or Joe Brown of Sturnsville signed a page in 1889. Ruth M. Brown of Smiths Mills, Quebec, signed a page. Two of Katie's teachers signed pages in her album. Susie P. Copp of Smiths Mills, Quebec, signed a page. E. Chamberlin of DeLand, Illinois, signed a page, while apparently teaching in the Stanstead, Quebec, area. If you have corrections and/or additions to the information above or insights on Katie, her family or any of the signers, please leave a comment or contact me directly. Thanks!